Eagle-eyed readers of my posts will have noticed that I haven’t been talking about New Zealand much lately. When I’m not too sick or bone idle and actually post something I’ve been talking about Borneo mostly. In part this is because I still have an enormous amount of material to cover from Borneo. But really, the reason I haven’t had much to say about New Zealand lately is because I haven’t seen much of it. Partly that’s because it is winter, which I guess makes this my annual *shake my fist at Northern Hemisphere types who have summer now* post. I’ve mentioned before that the seasons aren’t very interesting in a birding sense. We lose a handful of species, mostly waders flying across the whole Pacific but also a cuckoo flying just half of it. 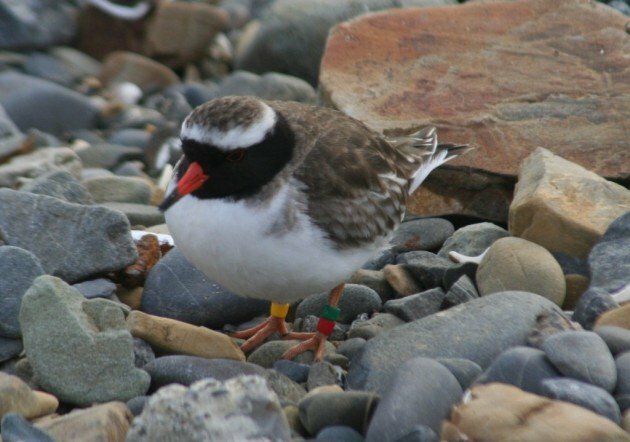 A few South Island birds spend the winter on North Island. If you’re lucky enough to go out to sea, or unlucky enough to go out to sea, depending on the weather, the types of albatrosses you see vary a bit. But mostly it just gets colder and darker and more unpleasant to be out. New Zealanders deal with the long winter blues, which aren’t broken up with anything as enjoyable as Christmas, in a number of ways. The more athletic go skiing. The more rural shoot pigs, deer and ducks. Otherwise they escape to the Pacific islands or Australia for winter sun, or finally they drink beer or wine and dream of summer until summer comes. I don’t ski, or hunt, and I sadly haven’t been to the tropical Pacific for a while. I will be going to Australia in August, and I spend a lot of time dreaming about summer (and my trip next year, more on that later). But I have been birding, and reasonably regularly too. But it isn’t the kind of birding that you really would find interesting to read about week in week out. I go to my local sanctuary when the weather is nice, where I see the same twenty or so birds each time. As a chance to relax in nature, its fantastic. But I can’t blog about it too often. Last weekend I managed to get out of central Wellington for the first time since January, which is pretty shocking. I don’t have a car and have been saving for later travel, but I should be able to go to the next valley over or across the harbour sometimes. I really must make more of an effort. Anyway, It was a pretty brief little trip, up to a place I’ve written about before, Plimmerton. This cute little seaside suburb at the extreme north of Greater Wellington is close to Mana Island and that brings, in the winter, one of New Zealand’s (and the world’s) rarest birds t its shores, the Shore Plover. I wrote a few years ago about my first encounter with these delightful little birds, which continue to visit the mainland although in smaller numbers than they used to. There is some speculation that they do fine on the island but don’t last long off the island, which would be a bad thing for a species as prone to wandering as this one. 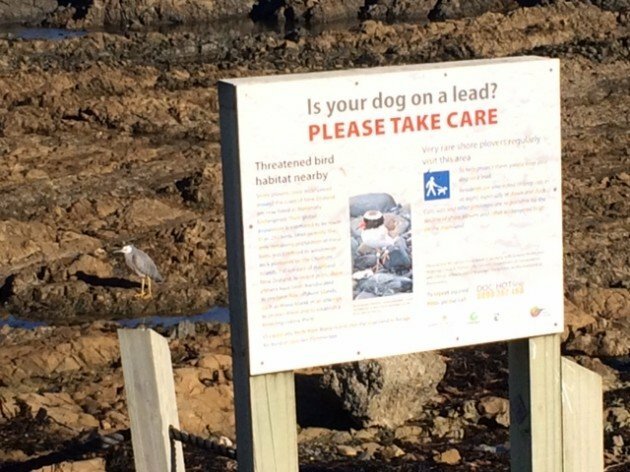 Happily the six birds that have been on the shore for the last month were there on Saturday, along with some new signs asking dog owners to keep them on a lead when going past. Being a fine winter’s day there were lots of walkers out, and it was nice to see they all had restrained their dogs too. A Shore Pover! One of only 300 in the whole world. The beach had other birds out too, including plenty of Little Black Shags and Little Pied Shags, along with an ordinary and larger Pied Shag, and some highly vocal Varied Oystercatchers. Best of all was an immature Black-fronted Tern. This was my first ever on North Island, and a nice topping to a nice little escape from the city. I really need to do that more often. One of the signs, with a White-faced Heron behind. “As prone to wandering as this one” means I should really start to check flocks of Ringed Plovers on the German coast soon? Beautiful bird. Sadly, they were still unreachable when I was in NZ waaaaay back in 2002. That Shore Plover is stunning! What a tragedy there are so few left. Nice bling on that totally adorable bird. With only 300 in the world, I wonder if they are all ringed.